It’s been a long time since we welcomed an unlikely hero into our hearts, and the magic that is Delaware St. John now beckons. He’s an ordinary guy – smart, good looking and has a self deprecating wit that is easy to like. Perhaps ordinary is not quite accurate, for Delaware has one trait that makes him most decidedly not ordinary; he sees visions of the dead. Since childhood Delaware has heard a cacophony of voices from the beyond, at first tentative whispers, but then raising in pitch and urgency as he grew older, demanding they no longer be put aside. Bewildered and feeling very much alone, he has a fortuitous meeting with Kelly Bradford, who runs a bookstore and is a part time paranormal investigator for paying clients. She’s attractive, smart, sassy and knows how to focus the maelstrom within Delaware. She’s also practical, organized, and often exasperated with Delaware, who doesn’t share those same traits. They’re a good balance for each other, whether they admit it or not. The voices are insistent. In Delaware’s nightmare they talk at once at different speeds, making understanding impossible. His subconscious listens, really listens, and hears a plea, “Delaware, please!” He awakens, and lets his special senses guide him to an old dilapidated mansion, Morrisville Manor, or as the locals have tagged it, “Midnight Manor” for its haunted reputation. As Delaware walks through the eerie halls, he sees visions from the past, and knows he must solve this mystery to once again have a restful sleep and unburdened psyche. The movement is point and click, by accessing directional arrows. An eye icon indicates an object with which you may interact. The interaction may be to view an item more closely, to hear a comment from Delaware, to use the item in some manner, or to pick up the item to place into inventory (becomes the grabbing hand icon). The inventory panel is below your main screen, and besides the objects that you have placed in it, there are also the controls for your Visual Imagery Communicator. This device can photograph or record areas of possible paranormal activity that are not seen by the human eye, and transmit the data to Kelly Bradford, who can then interpret what Delaware is encountering. In addition, Kelly can often provide helpful advice. From this panel you may also save, load, adjust volume, and exit the game. The game is played from a first person perspective, and you are playing Delaware in this first story. Activating a vision, whether inadvertently or completing part of the story line gives a thrill. Some visions are actions caught in time for your viewing, but there are others with which you may interact, which give a most unusual tingle. Like the Nancy Drew games, there is also a tutorial available, so that the very newest of adventure game players will feel confident. The game’s musical score is intriguing, promising yet untold stories from beyond the grave of past horrors, of playful sprites, of elemental forces that lurk just beneath the physical world. It is at once energizing and bittersweet, and gives notice as the story changes. How did you come up with the idea for an adventure series? Has a character like Delaware been forming in your mind for a while? How did you come up with the Delaware name? The idea for a new adventure series has been rolling around in my head for years but it wasn’t until last year I actually sat down and fleshed it out for Big Time Games. When I first set out creating the main character, Delaware, I wanted someone who was a loner, a bit separated from society but at the same time likable, someone you could relate to. The name “Delaware” is actually a name I’ve been fond of for quite a while, kind of an odd name and I thought it fitting since Delaware himself is kind of an odd character. The name does have relevance to the storyline of the game series that will come about later. Is the main character a lot like you, or someone you know, or is it inspired by a fictional detective? How much of your personal philosophy is imbued in the characters? I think inadvertently Delaware does reflect some aspects of my personality and beliefs as well as traits of people in general. I believe it’s crossed everyone’s mind every now and then “what’s my purpose? Why am I here?” but Delaware asks himself this much more often. He’s trying to figure out his place and why he has a gift that, more often than not, brings him nothing but trouble. I know of Inherent Evil and Whiplash, but there’s also a Bryan Wiegele listed as a designer for Command and Conquer – is that you also? After venturing into other genres, what made you return to adventures? Yes, I worked on Command and Conquer: Yuri’s Revenge, the expansion to Red Alert 2. It was a real treat to work on such a high profile game and was a great experience to learn how the RTS genre worked. From there I went on to work on Whiplash, which was also a terrific experience since I have a soft spot for 3rd Person Platform games, especially the cartoon ones. While I was working on Whiplash I realized I really missed working on adventure games and towards the end of that project is when I began to think about what I would do for a new adventure game. Inherent Evil had some flaws that always bothered me and I really wanted to take what I learned from working on that game to make a much better follow up game. When I had the opportunity to create a new adventure game, I leaped at the chance, I really love telling stories and no other gamer appreciates story more than adventure gamers. Have you written for media other than games? How important do you think good writing is to the success of a game? I think writing is very important, even in games where story is second or third priority. Bad writing is bad writing and will detract from the overall game experience. I had written Inherent Evil and did some very minor writing on the other games I worked on but up until now it’s just been for games. I say up until now because I’m currently working on a complimentary book series about Delaware and Kelly and the events that happened up until The Curse of Midnight Manor. It will be a young adult novel that would give players an in-depth look at the characters when they’re not “out on a mission.” I’m aiming to have the first draft finished by June. 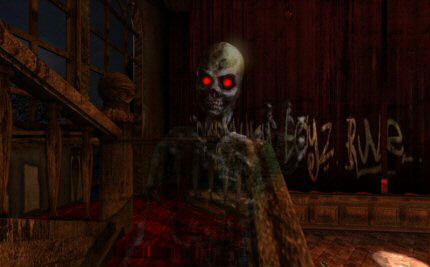 You’ve been quoted as saying that you’ve been influenced by The Beast Within, Phantasmagoria, and the 7th Guest. Is that accurate? Will Delaware be like any of the characters in those games? There seems to be a similarity between Delaware and Gabriel Knight is that so or how are they different? Yes, it is true. 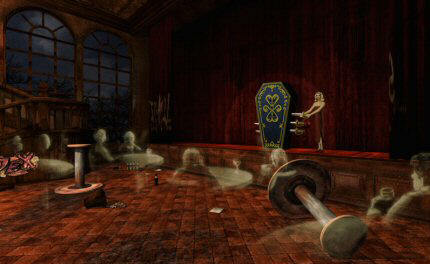 “The 7th Guest” was one of the first adventure games I played and I was in love with it. To this day I love the story concept and it remains one of my favorite games of all time. I played through the Beast Within and also had a very good experience with it. Although I will admit I got through the last 25% of the game with a walkthrough. I found the game to be a bit difficult towards the end. I’ve played two Gabriel Knight games; “The Beast Within” and “Blood of the Sacred, Blood of the Damned” and quite honestly I think Gabriel’s character in TBW was better. I found BOTSBOTD’s Gabriel to be a bit crude and less fun to play with. As far as comparing Delaware to Gabriel, I would have to say they’re two very different people. Gabriel is very much aware of his place in life and is comfortable with it. Delaware is young and, up until his pairing with Kelly Bradford, very uncertain of himself or what’s going on around him. Delaware has a personal tie to the mysteries he’s summoned to, where I feel Gabriel is there because it’s what he does; he solves mysteries. Something that I think is important for a game to be complete in my eyes is a powerful score. Have you used music in your game? Is there spoken dialogue, and if so, is it professionally voice acted? I agree with you. From the beginning I insisted we wanted to create a score for the game that would really be more movie-like and set the appropriate mood for the game. I found a very talented musician, Todd Kinsley, who not only provided the musical score for the game but also found us actors for the game characters. For Inherent Evil I did the acting along with friends of mine and I learned that lesson the first time, so Delaware, Kelly and all other characters in the game were voiced professionally. 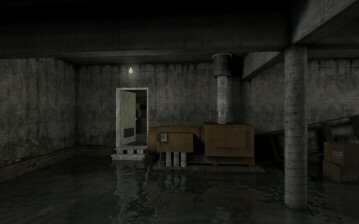 While you may have been influenced by other games, I noticed that Dark Fall must have been influenced by Inherent Evil, i.e. the scene where the ghost switches off the lights one by one. Frankly, I loved most things about IE, except the save system (I Know...). How much of that game are you bringing to this series – will it be as scary? What do you think makes a game scary? Is there a difference between scaring and horrifying? I don’t usually like mazes, but the one in IE was a work of art, and it demanded appreciation. Will you be using something like it in the new game? It’s funny you mention the “Stair Maze” from Inherent Evil, hands down that’s the number one thing I really heard back on negatively! Inherent Evil had some scary moments but I think there’s more atmosphere built into the Delaware St. John series that makes it a bit scarier. I think there’s a HUGE difference between “scary” and “horrifying.” One of my favorite “horrifying” games is Silent Hill 2: Restless Dreams, it’s such a great story that’s filled with grotesque and scary moments. And while I do appreciate games that create scares with horrifying images and events, for Delaware I wanted something more along the line of “Poltergeist” or “The Ring” where the atmosphere and events are oddly creepy and the scares come from pacing and tension building up. Back to the “maze” question, the new game does, in fact, have a puzzle involving following directions but it’s much shorter than the “Stair Maze” from Inherent Evil. What did you learn from the development of IE, and what did you make sure you did differently in this game? Were you able to do everything you wanted to do with the new game, or were there technical limitations? Inherent Evil was an interesting experience for me. It was the first game I ever created/worked on so that alone was a big undertaking. I had designed the game and story and we were midway through development when we signed on with a publisher. The publisher had their own contributions to the design process and the game shifted a bit from the original design. With Inherent Evil I felt it wasn’t as polished as it could have been, some items were hidden unfairly, and the lack of an in-game save was a big flaw. I’m very happy with how “The Curse of Midnight Manor” turned out. The game has a built-in hint system to aid players when they’re stuck, has a save feature that allows the player to save almost anywhere in the game and is a more unique approach to adventure gaming than Inherent Evil. There were aspects of Inherent Evil where we spoofed “traditional” adventure game elements -- with Delaware I think we’ve expanded on those game play elements. Have you had paranormal experiences, or an interest in the subject? Will the characters be using ghost hunter equipment? I’ve never had a paranormal experience myself but the subject matter does interest me a lot. I have a short list of “haunted” places across the US that, when I get free time, I want to visit and stay at. Kelly is the ghost hunter, complete with testing equipment while Delaware comes with his ghost hunting technology built in. In the first game Delaware investigates Midnight Manor alone but Kelly is able to “tag along” thanks to a communication device she bugs him with. Later in the series Kelly will be a playable second character that will investigate scenes using her ghost hunting equipment, for now it’s just Delaware and his sixth sense. What do you feel is the best part of the new game? The story, puzzles, dialogue? What sort of puzzles should we expect? Is it point and click? 2D rendered graphics? On your site it mentions “outrun the evil beast” – are there timed or action parts to the game? Is the game aimed at a particular kind of gamer? Is there mature content? How many hours of game play? Honestly I’m not sure I have a favorite part in the new game just yet. I usually develop a fondness for a game setup after I’ve walked away from it and played it later on. I hope gamers will like Delaware and Kelly as a team and want to see where their adventure leads. The “puzzles” in TCOMM are a mixed bag of logic as well as the common sense “lock and key” setups. There are also a few timed action sequences such as a creature that’s loose in the manor where Delaware has to run from it. 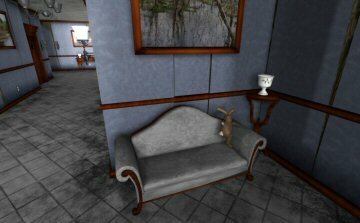 The game is point and click, 100% traditional pre-rendered adventure game. In the late 90’s the “future” was moving adventure games into 3D and honestly, I can’t think of a good “3D” adventure game. I think the focus was so much on technology that less love went into the games themselves. This is a game that I hope will be appealing to everyone: men, women, boy and girls. My intention from the beginning was to create a story and characters that a wide variety of people would enjoy playing along with. Delaware’s adventures, while creepy and filled with tense moments, aren’t going to be gratuitous. I believe you can make scary games without the use of intense violence and gore. We’re anticipating 4-5 hours of gameplay. We’re aiming to have people finish the first game and give it a quick second run through as the second game nears release. How many people are working on the games, and what role do you play? How long did it take to complete this first game, and do you still believe it is realistic to have a new game every six months? A total of eleven people worked on the game including programming, art and game scripting. We began TCOMM in November 2004 and completed it the end of April 2005. I whole heartedly believe a quality game can be completed in 6 months as long as there is good planning from the beginning. The system requirements, while not officially revealed, will be very low. A PC with Windows XP can go as low as 800GHz and run well. There’s been much ado about Star Force protection on the gaming forums. Will you be using it? I’m aware of Star Force but at this point we have not decided if/which anti-copy measure should be taken. In general the adventure community is pretty honest, they realize pirating a game, especially a game from a small development house, will only ensure the company closes down and no further games will come from them. How did you feel when the first game was completed (it is, isn’t it?) and what were you most proud of? How would you like people to remember this game? I felt tired! Haha. Just kidding, it was a good feeling, having it completed and ready for the next (and most exciting) step and that’s to make preparations to get the game into gamer’s hands. I would like people to remember this game as a great beginning to a story they loved…as they complete Volume 10. Is there anything I haven’t asked you that you think is important for our members to know about the game? I think we’ve covered just about everything. I thank you for the opportunity to talk about Delaware and I really look forward to the response from adventure gamers when it comes out. Thank you. Thank you Bryan, I can’t wait for the game to be released!